Good news, Football Head! Nickelodeon has finally delivered us our very first look at the highly-anticipated Hey Arnold: The Jungle Movie that is set to arrive later this year. The footage made its debut at San Diego Comic-Con and luckily for those of you who couldn't make it to the event, the network has released the preview online, which you can watch for yourself right here. Nickelodeon uploaded the footage to their YouTube channel just after it debuted at SDCC. It isn't a trailer, but it is actually a clip from Hey Arnold: The Jungle Movie. In the clip, we see everyone surprising Arnold with a video that goes over all of the good deeds he has done for others over the years, which also serves as a nice reintroduction to the world for viewers, since Hey Arnold has been off the air for more than a decade. This feels very authentic to the series and if the movie can keep that going for two hours, this could be special. 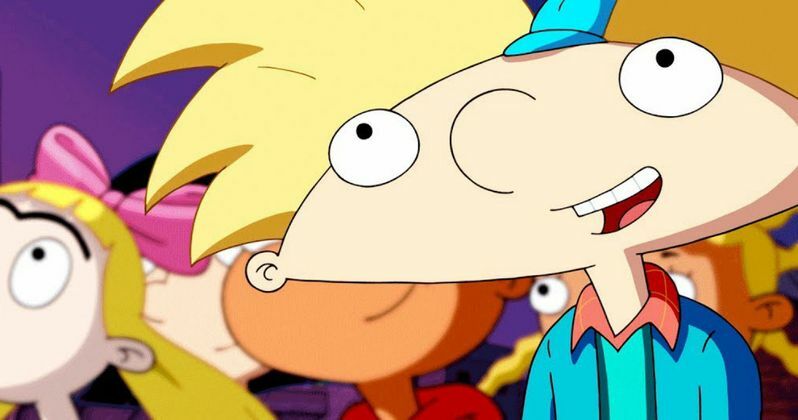 Series creator Craig Bartlett co-wrote and executive produced Hey Arnold: The Jungle Movie for Nickelodeon and it promises to be a satisfying conclusion, which is something Hey Arnold didn't have. The movie is said to follow Arnold and his friends on a quest to achieve his ultimate dream of finding his missing parents. The two-hour TV movie features a storyline that picks up from where the original series ended in 2004 and resolves unanswered questions and plotlines. Most importantly, Arnold finally getting answers about the whereabouts of his missing parents. The Hey Arnold Movie brings back Francesca Marie Smith as Helga, Anndi McAfee as Phoebe, Justin Shenkarow as Harold, Olivia Hack as Rhonda, Nika Futterman as Olga. Plus, Simpsons alums Dan Castellaneta and Tress MacNeille are returning as Arnold's Grandpa and Grandma. As for Arnold and Gerald? Mason Vale Cotton from Mad Men will be taking over Arnold duties and Benjamin Flores, Jr. will be taking over as the voice of Gerald. Lane Toran and Jamil Smith, the original voices of Arnold and Gerald, will be returning, but not to play their original characters. Reportedly, they will be providing voices for different characters, but they are still on board. Hey Arnold is widely regarded as one of the best NickToons that the network ever produced. The show has been met with a ton of critical praise as well as being truly adored by fans to this day, even though the series ended in 2004. Hey Arnold even spawned a movie, Hey Arnold! The Movie, back in 2002. Though, it only managed to take in $15 million at the box office. Craig Bartlett originally wanted to do The Jungle Movie as a sequel, but the lackluster box office performance kept that from happening. Now, Kids' Choice network is embarking on a number of original animated movies based on 90s series as nostalgia for Nickelodeon hits its peak. Be sure to check out the first clip from Hey Arnold: The Jungle Movie for yourself below.